A few months back I pulled my car off a dirt road and trudged through quite a bit of brush in order to get a closer look at this fire. 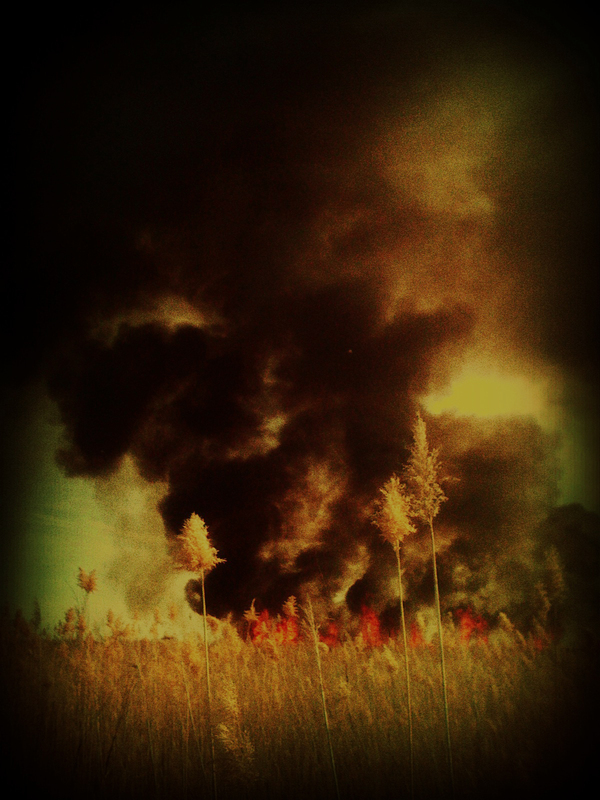 I was on my way home, and could see the plumes of black smoke for miles as I approached via the freeway. I decided on a whim to get closer and see what I could see, even though I didn’t have my “real” camera with me. I met up with an amiable fellow named Thomas, and together we went fire-hunting with our iPhones. It took a lot of cutting through the willows, but eventually we did come within spitting distance to the burn. Needless to say, it was an incredible sight. The photos don’t do it justice. I was really wishing I had a RED One with a long lens, or at least my D2X with me. The imagery, quite honestly, was breathtaking. Real, high resolution images would have been awesome, and high quality film/video would have been even better. There were a few times that the flames were a bit too close for comfort, though for the most part we were careful not to let ourselves become surrounded. But the thing that probably struck me the most—aside from the 30-35 foot high surges—was the living nature of the flames as they collectively danced along the tops of the brush, speeding to one patch, burning, pausing, then speeding to another. The heat rose visibly off of the browning reedtops as they bowed dutifully toward the flames, being tanned by the unbearably high temperature. It was clear that these flames had a mind and will of their own, as well as the power to command nature. You can’t help but wonder how anyone would be so foolish as to take its power lightly. As an aside, I’ve always wondered what fire is. It’s not solid, it’s not gas, it’s not liquid. It isn’t air, earth, or water. It isn’t made of particles, though it seems to produce quite a few as it burns. What is it? Its one of the few things in this world you can’t hold, but you can definitely feel. Maybe I’m way off in my assessment. For instance, maybe it’s actually a gas. I’m a photographer, not a scientist. Either way, if you can shed any light on the mystery, I’d love to hear about it in the comments. P.S. Notice the finger in the top half of shot number 3? Probably not. But that’s how I achieve manual exposure on the iPhone 3g in a high contrast scene. Not ideal, but hey, it works.